The body color of this small eolid (less than 25 mm maximum total length) is orangish to orange-yellow. The rhinophores and cephalic tentacles have distinctly obvious white tips. The cerata have blackish cores, an encircling white band above the mid-region, and a white tip. This species ranges from the central Gulf of California (Bahia Bacochibampo, Sonora, Mexico) south to the Golfo de Nicoya, Costa Rica. One of the first specimens of this species that I found was in the now over-developed Puerto Escondido region (south of Loreto, Baja California Sur). While snorkeling, I rolled a rock and saw it. I tweaked it off the rock with my finger, and the slug started to float in the water. I reached out. with my hand, encircling it, but the creature slipped through my fingers. Floating out in the water, it was suddenly inhaled by a passing fish. That could have been the holotype. Now it was fishpoop. Sadly, Dr. Schafer died in an automobile accident in Mexico during the summer of 1974. The name of this species is a dedication to those people and times--when scientists could avail themselves of the hospitality and generosity of Immaculate Heart College and the Crosby family. I remember well my first visit to the Las Cruces station. I was taking an independent study course from San Luis Rey College under the direction of Fr. Alberic Smith. That summer was the first Lunar Walk. We watched a Mexican TV station and Alberic listened to KNX from LA with his hand-held portable radio (hey, those were the primitive days) describing this one small step for mankind. Tim Lawlor (of Humboldt State College) and I shared the research boat. 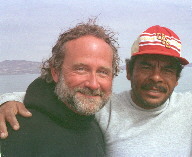 When we anchored of Islas San Jose, San Francisquito, or Cerralvo, he went onto the island looking for Peromysocus mice, and I went underwater looking for slugs. In addition to Phidiana lascrucensis, I also found my first specimen of Chromodoris baumanni. But that is another story.